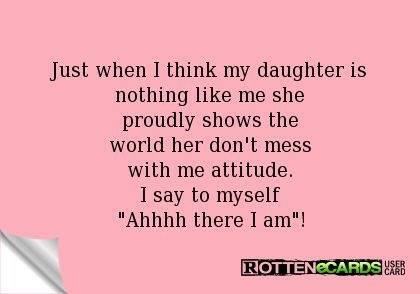 JUST WHEN I THINK MY DAUGHTER IS NOTHING LIKE ME SHE PROUDLY - ProudMummy.com the Web's Community for Mums. JUST WHEN I THINK MY DAUGHTER IS NOTHING LIKE ME SHE PROUDLY SHOWS THE WORLD HER DON'T MESS WITH ME ATTITUDE. I SAY TO MYSELF "AHHHH THERE I AM"! Laura! You and Ella! Altho she will look like you too! Michelle Stock 😂🙈 Pegs and laila? !